Honda is known the world over for its cars and motorbikes, it also makes mopeds for those who want motorized transportation where a motorbike wouldn’t do. In many countries, the only vehicle a 14-year old can legally drive is a moped. That makes a pretty large market, and there could be another large market with some four wheel moped’s equivalent. This is especially true in Japan, where parking is incredibly scarce, and most people not interested in performance because of high traffic. 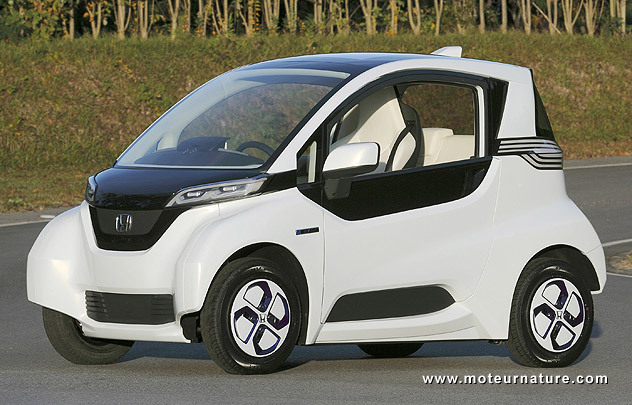 An aging population may also be a factor, and that maybe what Honda had in mind when it introduced that micro commuter prototype. It’s electric, has a 50-mph top speed and a 38-mile range. Hardly exciting numbers, but they match those of the Renault Twizy which may be Europe’s best selling EV this year. Few people would have bet on it a few years ago, but this is growing market. Nobody should be surprised to see more and more mainstream brands entering it. Back to Honda, the manufacturer will test its prototype next year in Japan. Nothing’s announced for production yet, but there’s no doubt many people are already thinking about it. Honda has designed its prototype with the driver in front, two children or one adult can sit behind him. There may also be an utility version with cargo in the back. In fact, it’s one platform that could lead to many derivatives. This is the proof of Honda’s ambition. Otherwise, the manufacturer would not have chosen an open architecture like that one.